It’s rare I do this – buy a book I’ve borrowed. But this one I wanted to keep. 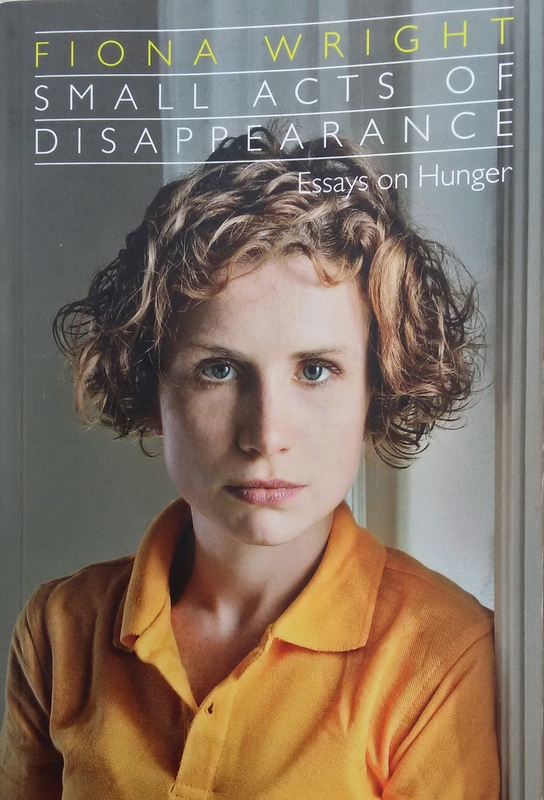 Fiona Wright’s essays on hunger in Small acts of disappearance are just captivating, published by Giramondo Publishing. Fiona is also a poet, which shines through when reading this very personal account of her eating disorder, her first collection Knuckled was published in 2011 also by Giramondo. Each chapter is an essay offering a different perspective on her illness at different stages of her life, beginning in university as a physiological issue before escalating into a dangerously intricate disease from she cannot disassociate herself. I’ll always remember the particular intensity that malnutrition brings on…That alertness of sensation, where every minute cell in the body is awake and alive to the smallest details of the outside world. This alertness, this finite sense of being, the paring down of the self to increase connectivity, could be compared to the state a poets seeks – an extension of the world around them in which they are insignificant and merely serve as a conduit for expression. Wow. That’s deep I know, but this is the kind of thinking this books provokes. Of course I’m not advocating restricting nutrition to increase perception (and I doubt I’ll ever be afflicted with such a disorder because I love food too much! ), but for the first time I understood the appeal, if that’s the right word. This is further explored in Fiona’s interview, Everyday Intimacies, with Rachel Morley from Sydney Review of Books. In Fiona’s case, this balance of the self against the outside reaches an alarming and life-threatening degree, where she confesses that ‘at my sickest, a lover once folded a blanket over my shoulderblade before curling against my back to sleep’. Interestingly I briefly discussed this book with a fellow poet the other night, and she too found the chapters on books, about how eating disorders are portrayed in characters, the least interesting, skimming through them as I did. Because the appeal of reading these essays is to get insider the author’s head, gain insight into a real person coping with it firsthand, rather than a fictional one. Anyway, I just found this book fascinating; it has given me a certain respect for the power of such an illness and indeed for Fiona, for sharing such intimate parts of herself and her private battle with the literary world. Thanks so much for this Julie – really interesting for me because of work I have done with young women with eating disorders. It sounds like a must read for anyone who is striving to understand the needs behind it. I do think it is one of the hardest conditions for loved ones to come to terms with because of the feeling of helplessness. I may well try to get hold of this book myself. I like the way you have expressed the impact it has had on you. And the literacy connection – I can understand that clarity and lightness (it has been said to me often). She sounds like a brave writer. Thanks Valerie. Yes, I would definitely recommend this. Fiona is a remarkable young women. Just need to get my hands on a copy of her poetry collection now ! You’ll enjoy it! Definitely worth it!